If you live in Arlington and need water damage or fire damage restoration services, Regent Restoration is here to help. We're on-call 24/7 and we guarantee we'll respond to your emergency within 45 minutes or less. Need Restoration Help in Arlington? Time is of the essence when it comes to saving your home from long-term water damage. It takes less than 48 hours for mold to grow and for damage to take hold. When you call regent restoration, we'll dispatch a crew to your Arlington home or business right away. Our technicians repair water damage by first extracting water from your flooring, removing damaged drywall and then finally replacing it. All of our water and fire restoration technicians are IICRC certified. This means they've undergone extensive training and field examinations, so they're prepared to handle any kind of emergency. It doesn't matter if it's a small leak or extensive fire damage in large commercial complex— our techs got it covered. If your Arlington home or business has suffered from fire damage, contact us immediately. When a fire burns in your property, it creates a trail of hazardous debris and a thick cloud of toxic smoke odors. Our fire restoration technicians have the proper safety equipment and training to return your fire-damage property to a safer, cleaner state. 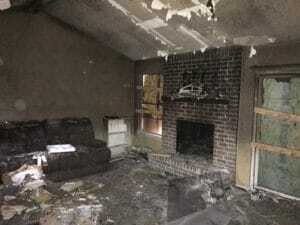 We repair fire damage by cleaning up the burnt structure of your home and clearing away all soot and debris before replacing any walls and flooring. Flood damage is not the same as water damage that occurs from something like a broken pipe or burst water heater. Natural flood waters contain bacteria within in them that can make you sick. This is why flood damage restoration should always be handled by a professional. If your Arlington home or business has suffered from flood damage, our restoration crews will extract contaminated water and sanitize affected areas. Water Extraction is the process of removing the water and controlling the water from spreading. Our restoration technicians use specialized water extraction equipment, such as vacuums and pump. With our training and equipment, we can guarantee that no corner of your property will continue to be saturated with water. If water has entered your home and damaged materials, such as wood floors, drywall, ceilings, and furniture, we can repair it. Our water damage repair teams can restore expensive investments, like your wood floors. We'll completely remove the water using non-invasive drying systems and restore them to their pre-loss conditions. When a fire burns in your home or business, it creates a thick smoke odor and covers everything in soot. This smoke is not only unpleasant, but it's harmful to your health. Our fire restoration technicians will use industrial-grade deodorizers to get rid of noxious smoke odors. We'll also pack up fire-damage materials in your home and take them to our storage facility for cleaning. Using advanced equipment and restoration techniques, our experts will clean the soot and smoke damage from your property. Regent Restoration is one of the leading fire and water restoration companies in Arlington— and there's a reason for that. We don't believe in surprising our customers with a bill they didn't sign off on, which is why we always provide free estimates and damage assessments before any work is done. We'll also help you file an insurance claim and work hard with your company to get you the best coverage for your losses. If you're looking for a trusted restoration company in Arlington, choose Regent Restoration.